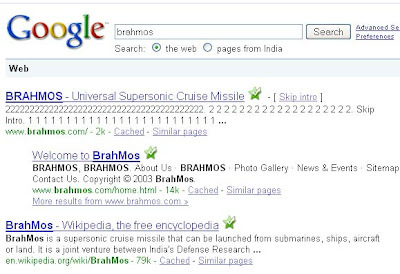 I had visited brahmos website to know about the company as it is located in my state.See what a google search displays.. Interesting the ones and twos in the description.My brain (idle lazy fellow up there) told that it is possible because i remember seeing a flash animated page as intro at the home address. Here is my AVG Websheild responded when i visited the home page. I went to know who owned the domain cdmon.org and found the result here. No it was just the basic and starting website of Brahmos and has a flash page as home page, that is why you are getting 1s and 2s. Now you can check it with a very new look and user friendly.